Can I watch 1080p torrents while downloading? Most large torrent files (8-20 gb) take quite a while to download. Is there software for Mac OS X that allows me to watch them while downloading? We need a torrent client that can download the movie file parts in order, not randomly. We need a player that supports playing incomplete files. We need a connection that is faster than the movie’s bitrate (and a torrent with enough peers obviously). Previously I used BitThief. It is developed by a technology institute in Zurich. It didn’t have a polished GUI and took a little bit too much CPU while downloading. There's new client I found thanks to @diimdeep. 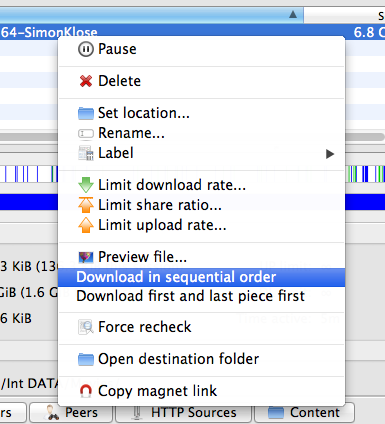 It is called qbittorrent and it is awesome. If the movie is 1.5 hours and the ETA is 17 minutes, then the speed is sufficient. # 3 is trivial. Although you could cope with slower connection, if you download enough buffer for playback. # 1 is somewhat trivial. 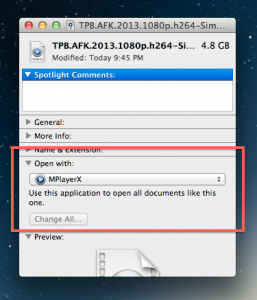 VLC can start the playback of a file if the file's headers are downloaded (first pieces of the file). 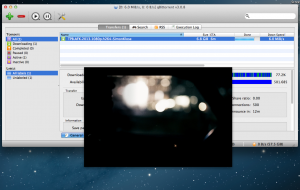 Seeking is a bit limited and I don't remember correctly if VLC stops when encountering a (too long) gaps in video. On Windows I've used GOM Player, which was more laid-back with missing frames. # 2 is counter-intuitive. While many clients allow you to prioritise the files, prioritising pieces is less common. This is simply because torrents are designed to transfer big sets of data fast. A large reason why torrents are faster or more efficient than an ordered transfer of a file is due to the fact that torrents pick the easy fruits - whatever parts of the file are available from the least loaded / closest source are what get downloaded first. Statistically, you should expect to be missing key parts of the beginning of the video until the transfer is almost complete. The speed is achieved by initially splitting the file(s) to pieces, sending the pieces to the clients in the network and then all the clients will share and merge the different pieces. The operation is best described with an animation found in BitTorrent's Wikipedia article. Unfortunately I can't recommend any torrent clients that give you the option to prioritise the pieces—if there even are any—as I've never really had the need. 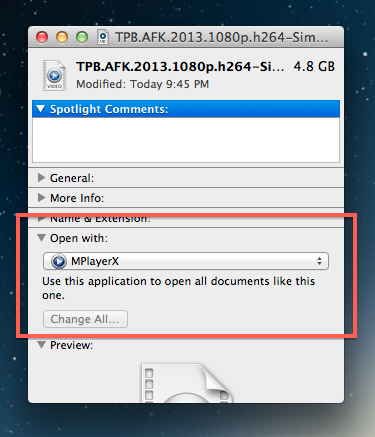 Also note that BitTorrent isn't exactly designed for playback while downloading (QED), but for just sharing data. You might get better luck with on–demand video rental services available in your area, which usually use software and protocols specifically designed for HD-playback over the net. No, because Torrent download files in chunks and not sequentially, so you cannot be sure to download the various pieces of the file in the required order to view it. 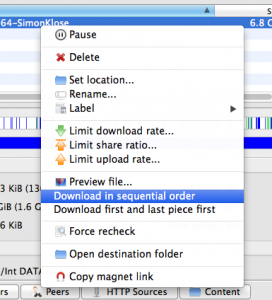 You can try a specialized Torrent client (like Miro), but I do not believe if will works. There is a program called Vuze that is available but requires a yearly subscription of $25 for streaming while still downloading. isoplex - http://isoplex.isohunt.to/ this player has very ascetic interface, but has function to open and play torrent file. I watched part of 1080p movie with very little waiting on beginning and flawless playing latter. tribler - http://www.tribler.org/ is more torrent client that player but have ability to stream torrent file while downloading. my recommendations are, bit-comet for private torrent trackers, you can change the user agent in the options which allows you to download from them. the best public client is Video Tyrant, as it never buffers the video. bit-comet works also really good on public trackers. streaming 20gbs on a home broadband is impossible, i can guarantee you this your going to experience buffering every 12 seconds you need either 100mbit or 50mbit home connection. you should download 10mbit per /sec to be able to stream HD torrents. Not the answer you're looking for? Browse other questions tagged software-recommendation torrent . Is there an app that will scan a document and upload it to Google Docs? Can I transfer and view xvid (avi) videos on an iPad? Does downloading torrents to an AirDisk affect my internal SSD? How can I view (offline) the full English Wikipedia on OS X? Recommendation for genealogy software for OS X? Recording a Screenscast a webinar?